Take a quick trip to Malta with us to learn some interesting facts, and print out our Malta flag printables and flag colouring page. Malta is a small archipelago of islands in the Mediterranean, 50 miles south of Sicily, consisting of Malta, Gozo, Comino and two uninhabited islands. Malta is the most densely populated country in the EU. and has the smallest capital city in the EU - Valletta. Because the island is located in the centre of the Mediterranean, most European and Middle Eastern capitals are only between two and four hours flying time away. A warm climate and many important monuments have made Malta a popular tourist destination. Malta has been tilted in a northerly direction due to tectonic activity, resulting in cliffs of up to about 800 feet (250 metres) high. Malta's location and importance as a naval base have led to many rulers over the centuries, including the Phoenicians, Romans, Moors, Normans, Hapsburgs, French and British! 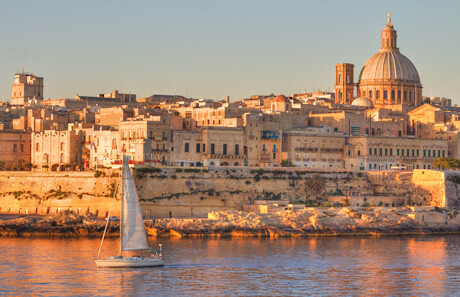 The first settlers in Malta can be dated back to 4500 years BC, when people from the neighbouring island of Sicily went to investigate the island by crossing the narrow waters. Malta became part of the Byzantine Empire in 533 AD. In 1530 Charles V gave the island to the Knights of St. John. The Knights of St John ruled Malta for 250 years. Their symbol, an eight-point star, is known as the Maltese Cross. Valletta boasts a magnificent walled fortress built after the Great Siege of 1565, when a small force of Knights resisted the mighty navy of Suleiman the Magnificent. In 1798 the French and Napolean arrived. The French controlled the island until the British helped to expel them in 1800. Malta joined the British Empire in 1814. In 1942 the Maltese people were awarded the George Cross medal for bravery by King George VI after suffering a siege that lasted 154 days. Malta gained independence from the UK in 1964, becoming a republic in 1974 and a member of the EU in 2004. The name Malta is said to come either from the Phoenician word ‘malat ‘ which meant refuge, or the Greek word for honey which is 'melita’. The Phoenicians were great sailors who settled here around 800 BCE. Malta was 5 times larger 13,000 years ago when the sea level was over 85 metres lower than today! There was even a landbridge connecting Malta to Sicily. 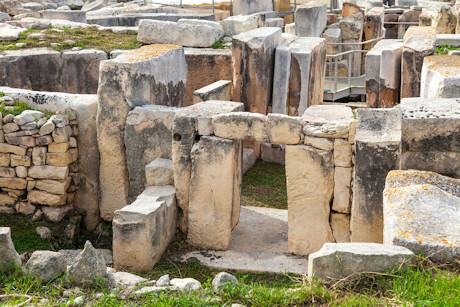 Malta has many Neolithic stone temples. Ggantija on Gozo was built between 3600 and 2,500 BCE, even before the Pyramids and Stonehenge. The stones are so large that local villagers thought they must have been built by giants! Gozo is thought to be the island called Ogygia, home of Calypso, from Homer's Odyssey. The pharaoh hound is the national dog of Malta, not - despite its name - the small Maltese dog. The hounds have pointed ears and came from ancient Egypt. They are used for rabbit hunting. Children’s toy maker Playmobil has its biggest factory outside of Germany in Malta, and 2 million figures are made each week. Visitors can ride on life sized toys at the theme park next door!